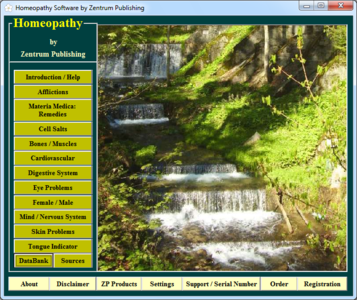 Homeopathy Software by Zentrum Publishing lists over 400 homeopathic remedies (Materia Medica) with symptoms & health problems. Homeopathy Software provides a wealth of information in 3 databanks: Afflictions (displays homeopathic remedy charts by affliction and related symptoms), Materia Medica (lists information on specific homeopathic products), and Cell Salts (tissue salts). The data bank Homeopathy lists homeopathic remedies and products by symptoms and by affliction. It also includes a Tongue Indicator tool and quick Reference Charts for afflictions of the Eye, Heart, Skin, Nervous and Digestive Systems. Note: Program is patched so…simply ignore registration option.